Southern VT Real Estate | Josiah Allen Real Estate Southern Vermont's Leading Independent Brokerage. Since 1962. View all Southern Vermont properties brokered by the agents at Josiah Allen Real Estate. Find homes, land lots, commercial properties, and more in the Northshire, Stratton and Southern Bennington County areas of Vermont. With offices in Manchester and Dorset, our realtors are happy to help you find just what you're looking for. Contact us today! Remember to register to "favorite" listings you love and receive notification when similar properties hit the market. Established Inn with 16 renovated rooms. The ideal location near town gives good visibility on the route leading from Manchester to 4 ski resorts and year round outdoor recreation. The rear of the Inn overlooks Bromley Brook and the beautifully landscaped property allows guests private enjoyment of the brook with the mountain view beyond. Together with a nice pool and a breakfast room with large central fireplace, the well-maintained Inn is great for families and groups traveling together. And for a buyer or a family seeking a home-based business, the 2-story, very private, handsome owners' quarters, built in 2005, is exceptional. With 3 bedrooms and 2 1/2 baths, it features wood floors, radiant heat, open living with a beautiful kitchen, 9 foot ceilings, a master suite with steam shower and jacuzzi, attached heated garage and a view to the mountains from both levels. At asking price; the new owners would enjoy a 5.5% CAP rate when an all expense paid life style is included when making a financial evaluation of this property. There is plenty of upside potential for this property; all going to the bottom line! First time on the market, in the heart of Manchester with spectacular views is this rare property which consists of 20+ acres of open field, including a 2500' grass air strip, a 4000 sq.' home, an airplane hanger that will accommodate 4 to 6 small planes and a separate pilots lounge. The home was under construction when the family stopped the progress. It needs considerable work to finish the vision, however most of the structural and mechanical systems and wiring are in place. It is in a state where the new owners can put their own input for design and utilization with a good start from the quality components that are there. There is a first floor master, a 20 ft. indoor wave pool and a rooftop "control tower" with open views of the Green Mountains. A variety of development possibilities with this excellent and unique offering. This newly constructed Greek Revival farmhouse combines the latest in ENVIRONMENTALLY responsible design with HISTORICALLY inspired architecture on the banks of the West Branch of the Battenkill River. Enjoy your morning coffee on the back porch or stone patio and enjoy the captivating views to the Green Mountains and the Taconics across 13 acres of common land. Luxurious details abound inside...Random width wood floors with square cut nails, stone floors in the mudroom and bathrooms, crown molding, custom kitchen cabinetry, custom vanities, stone counter tops through out. Bennington County 131 acres laced with trails that have been hand carved over the last 15 years to such vantage points that it is impossible not to appreciate every acre!!! The orchards, hidden meadows or pastures accommodate equine, wild life and lovely building sites are easily accessed... This is a sanctuary worth experiencing!!! The residence is impeccably designed with an eye for detail inspired by reclaiming antique architectural niches, cabinetry, lighting and amazing flooring through out... Gracious portions that flow easily for any lifestyle and need... The ceilings are 9 feet with vaults in the Great room, Kitchen and Master bedroom of 14 feet... There are room extensions offering three window walls for the Living room, Great room, Dining room and Master Suite which by the way offers generous three rooms of private and luxurious quarters. The fireplaces and hearths are in all the appropriate living and suite areas... The views to the Southern Taconic Range with gentle rolling mountains in the foreground. Remarkable unfinished attic and walkout windowed basement that offers auto drive in option and dumb-waiter... A masterpiece in design and execution... Serenity... and all that land can give back to it's steward! 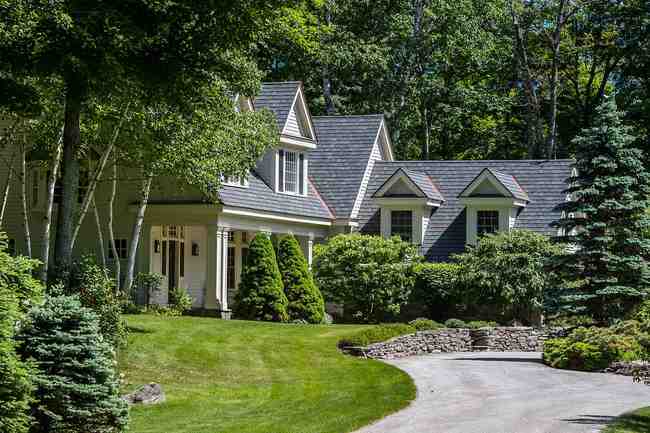 15 minutes to the Dorset Green... 40 mile rail trail... easy access to Albany and greater Manchester amenities... Amazing Estate quality offering!